Boston is known for its holiday cheer as soon as the cold weather hits, and this year is no different. If you’ve already started decking out your halls, don’t go rummaging through your basement for the artificial tree just yet (unless your allergies do not permit otherwise). 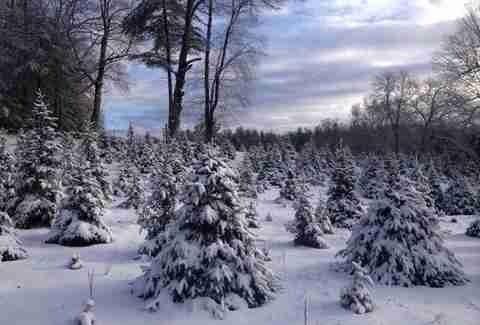 Venture out this season with the help of this list of the top spots near Boston to pick up the perfect, real Christmas tree -- sure to fill your home with holiday cheer and pine needles. Looking to stay close and avoid breaking a sweat (and potentially your back)? 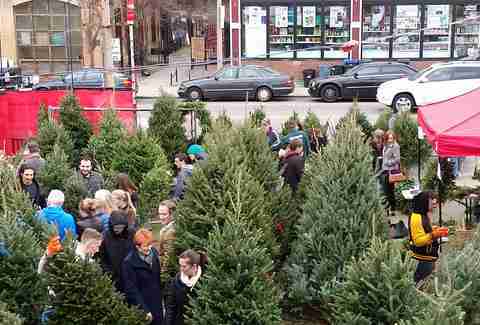 Stop by Boston Christmas Trees, conveniently located near restaurant and bar Lulu’s Allston, for a slice of holiday heaven on Harvard Avenue. 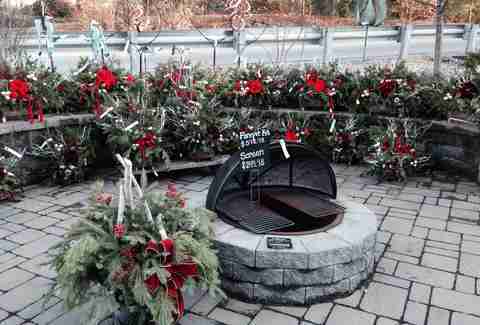 Since 1969, Boston Christmas Trees has also sold garland, mistletoe, mantle pieces, table baskets, and outdoor lights. As a heads up, parking is free if you would rather not lug your fresh pick onto the B line. Another spot close to the city, Pakeen Farm invites you to wander the fields with hot chocolate in hand while on the search for your Christmas tree. Chances are, you’ll find some of the best trees here considering each one is nurtured for over eight years before it’s tall enough to sell. This “One Stop Christmas Shop” has all of the holiday essentials including both fresh and artificial trees, poinsettias, ornaments, and even extension cords. 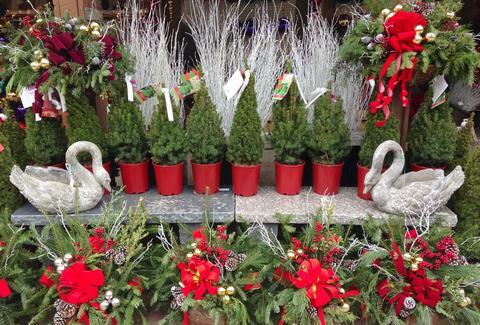 You can check off almost everything on your Christmas to-do list after stopping by Wolf Hill Home & Garden, which means more time spent on your wish list. 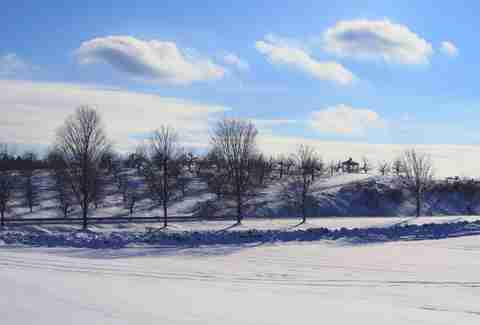 With over 10 years of experience planting trees on its ten acres of land, you won’t be leaving Deerfield Tree Farm with a Charlie Brown tree (unless you like the minimalist vibe). In fact, the farm’s website guarantees the perfect tree to help recreate your very own Clark Griswold moment. For four generations, this family-owned and -operated tree farm has welcomed back familiar faces year after year. Using greens and pinecones found in its fields, The Christmas Tree Farm also offers a selection of handmade wreaths in heart, cross, candy cane and tree shapes as an ideal gift to bring to that holiday gathering you tried getting out of. If the name of this farm isn’t enough of a selling point, how does free hot chocolate with a side of candy canes sound? Mistletoe Christmas Tree Farm takes pride in not only providing rows on rows of pines, but fun for the whole family -- just in case Thanksgiving dinner wasn’t enough time spent with them. With multiple locations in Massachusetts and a location in New Hampshire, Crane Neck Tree Farm’s business and tree supply continue to grow. With weather permitting, visitors can take a break from trudging behind the group and hitch a tractor ride throughout the fields. Come winter, Smolak Farms says goodbye to apples and hello to hundreds of fresh-grown trees and holiday-themed events. All season long, the farm hosts activities from a tree-lighting festival on November 25 to tea with Mrs. Claus on December 10 and 17. Looking to brush up your decorating skills? Impress your traditionalist relatives and keep up that everlasting competition between you and your siblings by attending a cookie decorating class held every Friday in December. If you’re looking for a place to blow off some holiday steam while trekking for your tree, Vandervalk Farm & Winery says it all in its title. With handcrafted wine from the farm’s own berries, the adults in the group will have something to spread some cheer over. Plus, free warm cider and snacks are a hit for everyone involved. Another family-owned and -operated farm, Sleighbell Christmas Tree Farm offers plenty of space to set the scene for the annual Christmas card your parents are adamant on taking again this year. Once the photoshoot’s wrapped, don’t forget to stop by the gift barn to check out local crafts and home decor. 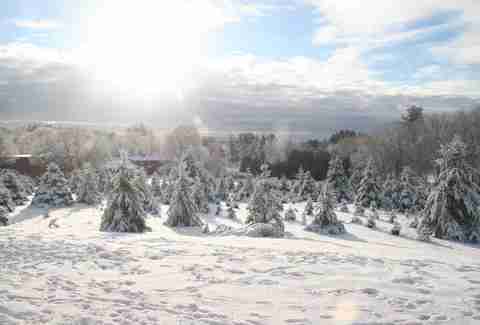 To find and support even more local tree farms near you, check out Pick Your Own Christmas Tree for more options! Jillian Hammell finds her favorite spots in and outside of Boston while scrolling through her Twitter feed and digging up classic vines. Follow and send her these classics @jlhamml.